Growing up in Kansas and Oklahoma, Spenser and I rarely got to enjoy the wonders of the ocean on a regular basis, which probably explains why we love going to aquariums so much. 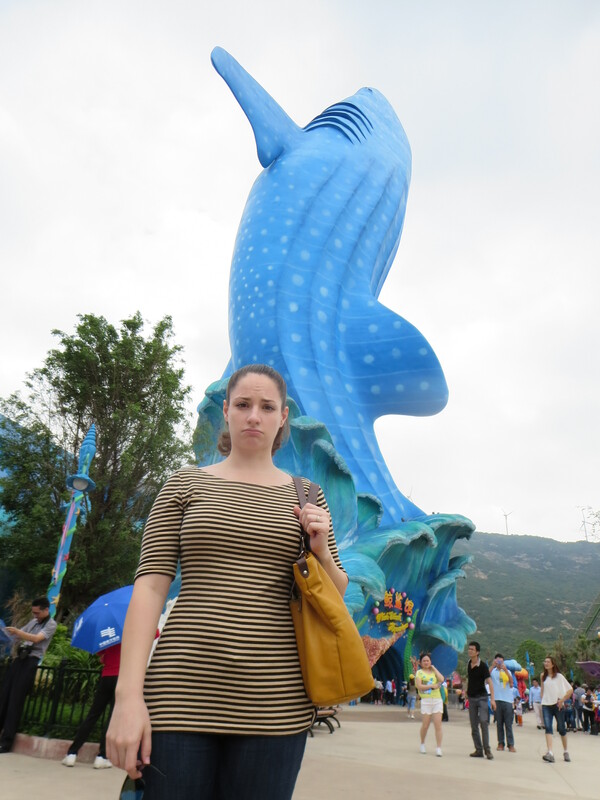 Luckily for us, the new “World’s Largest Aquarium” just opened up in Zhuhai so we knew we had to go. A giant manta ray entrance? Yes! Perhaps Spenser and I should have done a little more research before we left because we thought the title of “World’s Largest Aquarium” would go to an actual aquarium—indoors, peaceful, educational, entertaining. 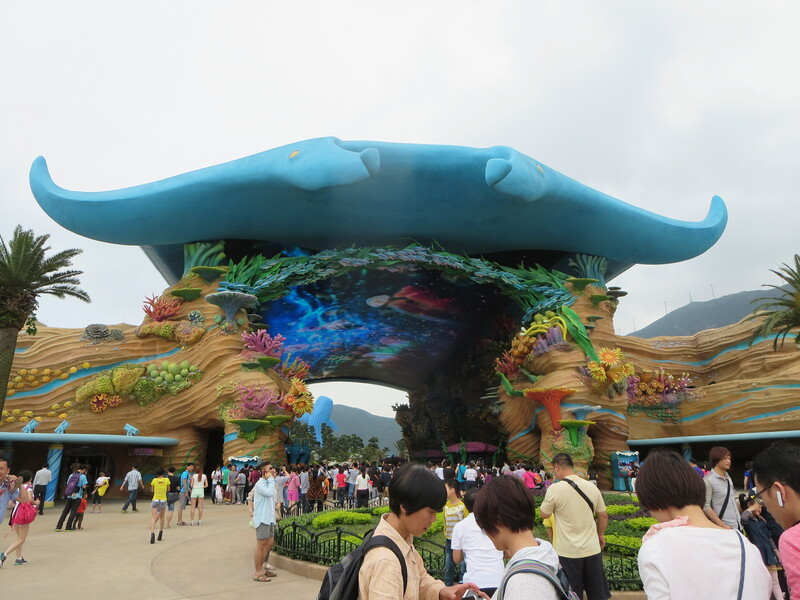 What we didn’t realize was that the Chimelong Ocean Kingdom is two parts amusement park to one part aquarium. 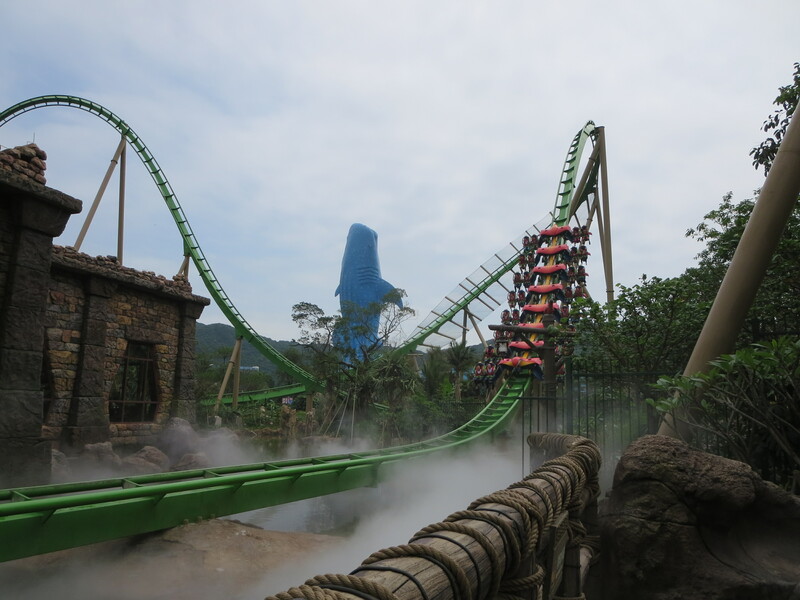 Oh, and it’s a full on Chinese amusement park so it’ll be you and at least(!) 10,000 of your closest friends battling to get to the front of an exhibit to take pictures of the animals. No real aquarium is complete without an octopus carousel. Upon entering the ocean themed park, we high-tailed it to the poorly named Whale Shark Aquarium to see the actual largest aquarium part. Why is it poorly named, you ask? It has a giant whale shark on it so it must CERTAINLY have whale sharks inside of it, right? 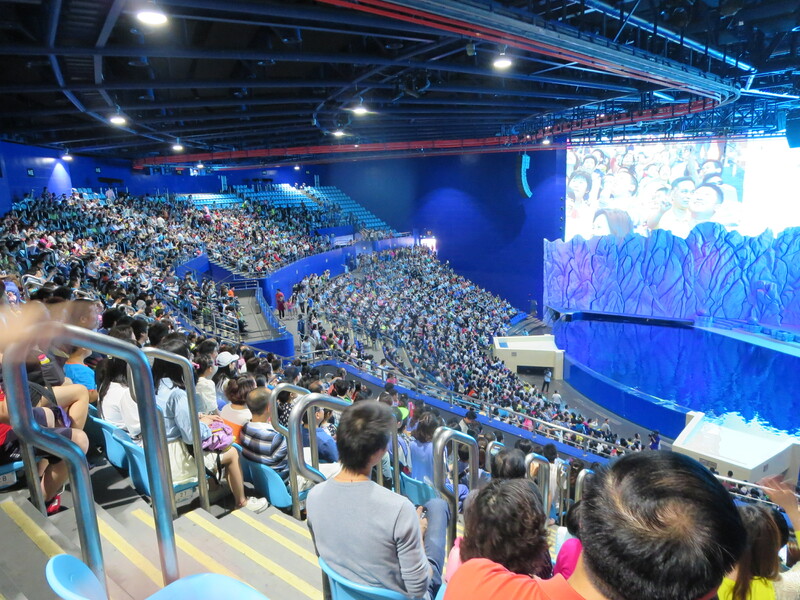 It’s the world’s largest aquarium, after all! They can totally fit whale sharks in there! They even showed whale sharks in their advertisements and this was almost the primary reason I was excited to go. I’ve never seen a whale shark and they showed three in the TV commercials! Well, everything lied to me. This place has zero whale sharks but the freaking massive tank was still pretty cool. Now that’s a big tank. Oh! Look at that sting ray! At the end of the aquarium, I was still confused about the lack of whale sharks so I asked Spenser to ask a gift shop attendant where they were? She said they haven’t come yet and offered no explanation why or when they would arrive. My expectations were dashed and I was disappointed for a short amount of time. But then I we noticed that the beluga whale show would be starting soon, so I perked right up and we headed over to the super-sized beluga entertainment hall. Spenser and I arrived at the Ocean Kingdom right when they opened and it only took us around 20 minutes to go through the aquarium part before strolling over to the belugas, so hopefully that gives you some idea of just how popular this amusement park is. So many people. We were there during a holiday (I don’t remember which one) and the entire beluga theater was packed within minutes. Ok, the beluga show was actually a lot of fun and it really lifted my spirits. We strolled around the park for the rest of the day and as the clouds floated away, more people swarmed in. Most of the exhibits were pretty cool, but the sheer amount of people began to wear on us very quickly. 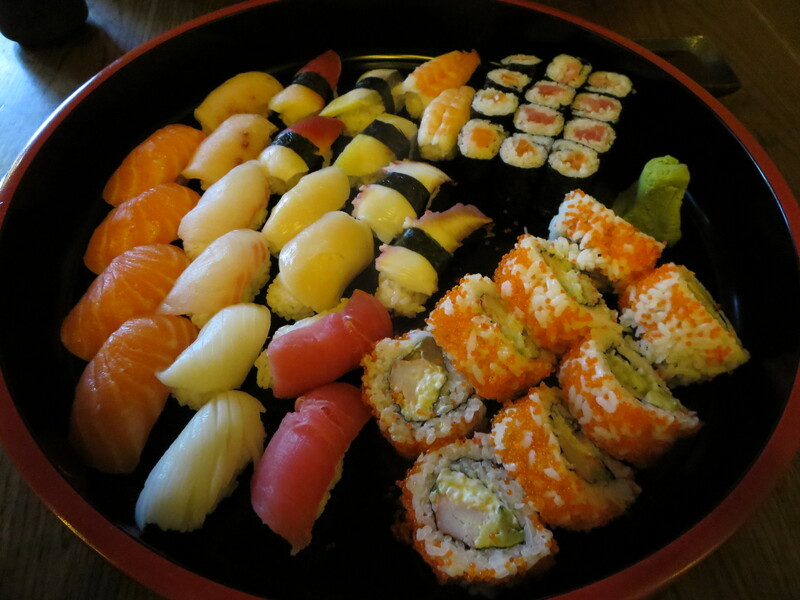 There was also a distinct lack of typical amusement park food. You could get skewered squid legs and hot dogs that had obviously sat out way too long. We hot dogged to prevent us from passing out and continued our journey further into the bowels of the amusement park. You could pay to feed the sea lions but it looked more like teasing. The walruses were my favorites. Too many dolphins in too small a space. And it was amusing but after the Singapore zoo with all of its free roaming animals that all looked happy in very large habitats, this was a little disappointing. It seemed like they just crammed as many animals into each enclosure as possible. Now I’m not a marine biologist or anything, but having eight to ten dolphins in a very small space just seems wrong. After witnessing things like this for close to three hours, our patience was wearing thin and we decided to shake things up a bit to make ourselves feel better. The roller coaster was super fun and invigorating! With our new found energy, we decided that it was finally time leave the park and visit to Macau, which we will discuss in “A Very Fishy Day: Part 2.” Until then, enjoy a preview of Macau at the end of our Ocean Kingdom clipvid below.